LINCOLN, NE — Former Texas Longhorns football head coach, Mack Brown, will be the keynote speaker at the Nebraska Coaches Association Big Red Football Coaches Clinic scheduled to be held on Saturday, April 4th, at the Hawks Champions Center in Lincoln, Nebraska. The event is a week from the Red-White Spring Game in Memorial Stadium. For the Big Red Football Coaches Clinic schedule, Click Here. Source: CornNation.com. Texas Longhorns head coach Mack Brown announces retirement Dec. 2013 in press conference. Early Bird Registration is $50 per person through March 15, 2015. After March 15, 2015 the cost will be $65 per person. Registration is open to the first 1,000 REGISTRANTS. NO registrations will be accepted after March 28, 2015. NO walk-up registration will be accepted at the clinic. For registration info, Click Here. 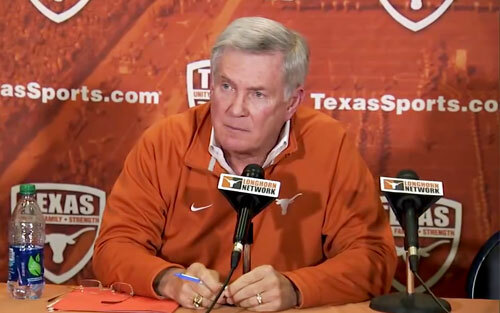 Watch Texas Longhorns head football coach Mack Brown’s Dec. 2013 press conference as he announces his resignation effective the Dec. 30 game vs. Oregon in the 2013 Valero Alamo Bowl. Mack Brown has served as head football coach at the University of Texas since 1998, leading the Longhorns to two Big 12 titles and a national championship in 2005. In 2006 he was awarded the Paul “Bear” Bryant Award for “Coach of the Year”. On November 27, 2008 he achieved his 200th career win, making him the first Texas coach to reach that mark. On Dec. 14, 2013, Brown informed the team that he would resign after the Alamo Bowl. Sports Speakers 360 is a booking agent for pro athletes. If you would like to book Mack Brown for a speaking engagement, appearance or endorsement, contact Mack Brown’s booking agent for fees at 1.855.303.5450.